Happy Wednesday and happy WIAW! Only one more day to go until we enjoy a lovely long Easter Weekend! Two days after my first Half-Marathon I am almost back to normal! My legs are neither stiff nor hurt with any movement anymore. I’ve had a fantastic weekend in Vienna with loads of great food. I enjoyed pizza and burger, ice cream and coffee, we ate falafel at an oriental restaurant and had a lovely fresh pressed juice. Pure bliss! So back at home yesterday my food rut was totally out-of-place. But I’ve learned a lot about and from my body over the last 12 weeks so I just drifted with the flow 😉 Many thanks to lovely Jenn, for hosting this fantastic link-up! I had a morning appointment for which I had to drive to the main campus. After the meeting I went to an office supplier and bought a new filing system for my desk. Finally my desk looks tidy now. A huge win for my peace of mind. I had a nice chat with my assistant over a cup of coffee and then after a while I was hungry again. Time for my breakfast food! 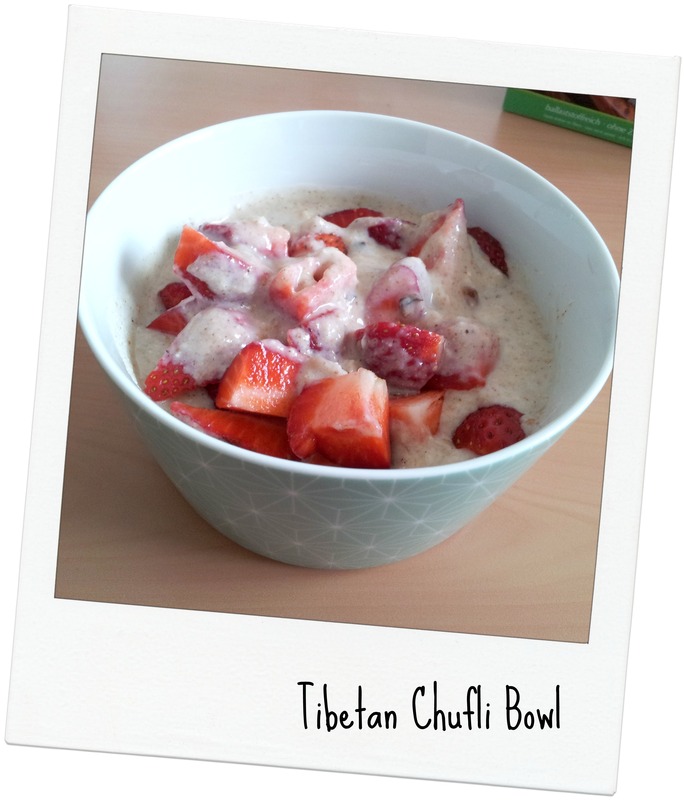 I had a bowl of Tibetan Chulfi, a porridge made of barley, tigernut and dates with some soy yoghurt and strawberries. Very yummy and very filling! I drank so much water over the weekend that I desperately needed a change. So I added some lemon and mint for additional flavor. A winner! So refreshing and really a nice change! I had an inner debate all day long about weather to go to my Power Plate Workout or not. In the afternoon I decided that I could go. So after work we headed back to our hometown and quickly went to the grocery store to stock up on some essentials. Then I dropped Stefan off at our Soccer Club where he had to attend a coach’s meeting and I went to my gym. After my workout which went pretty smooth considering the state of my legs I stopped by my Mum for a quick visit. Later at home I craved cheese so much that I ditched my dinner plans and fried some Quesadillas for us! Today I have to stay at home as a carpenter is coming over to have a look at out leaking windows. Tonight I have soccer practice and I can’t say that I am not looking forward to move again. A little running and stretching will do me great! Any ideas why cold lunch is such a great breakfast sometimes? What do you do when your body craves different food than you have prepared or planned for the day? Ohhh that is such a double edged sword question- Dinner time, it’s usually alright because I have options but so many times I bring my work breakfast/lunch and crave something else! I LOVE your breakfast- love the savoury! And craving cheese must ALWAYS be satisfied! Glad the soreness is wearing off! Okay finally someone with me here! Stefan absolutely doesn’t understand the concept of craving. He craves “food” but nothing specific! Yes that’s so true. When I have a non-breakfast breakfast I usually come to the point when I NEED a smoothie or pancakes or something alike later that day! Yessss for the pizza! I love to have a second breakfast for my afternoon snack! Pancakes, a smoothie e.g. so good! 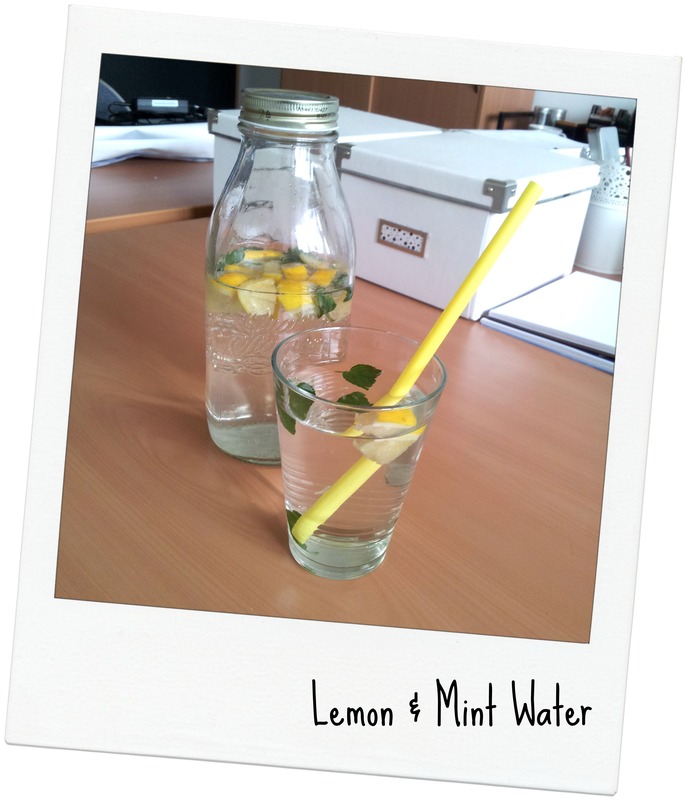 I’ve never tried lemon and mint water, but that would be a fun way to shake things up! 🙂 And that homemade chocolate creme looks wonderful. I totally break the norms of what to have for breakfast. Chicken… Beef… Zucchini. Lol. 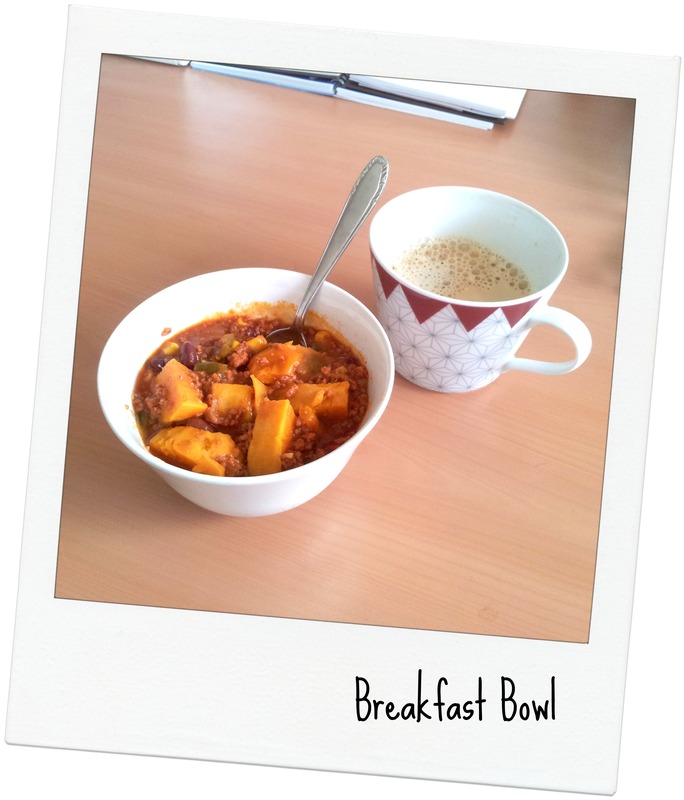 Chili sounds like a great breakfast to me! Haha I once had leftover steak for breakfast! That was wonderful! 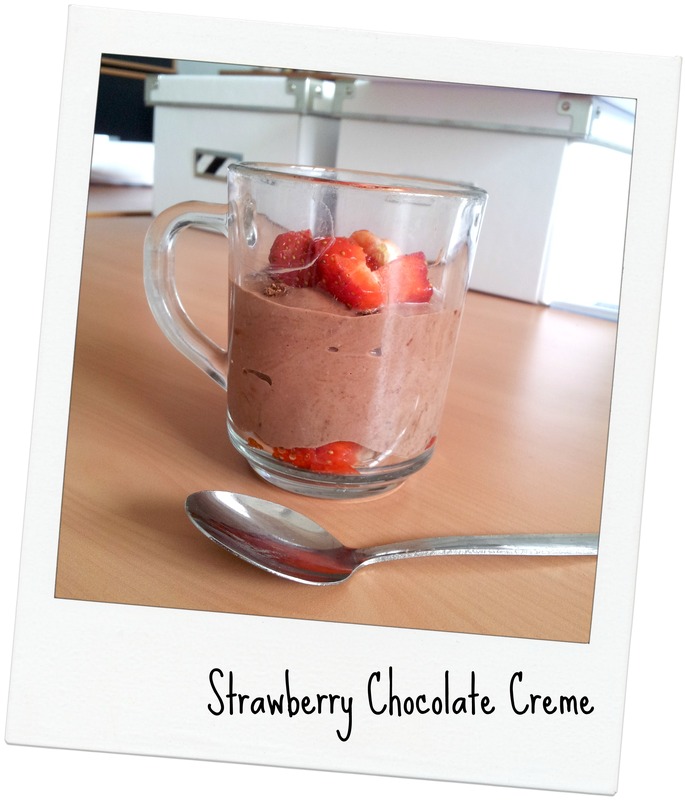 Your chocolate desert looks incredible, I also like pretty food – Sometimes I wake up craving something different and like you I just swap my meals around but it doesn’t happen often as I rarely have a savoury feeling first thing! Ummm that Tibetan Chulfi sounds SO GOOD! I can’t believe I have never heard of that before– I will definitely have to give it a try… a whole bunch of ingredients that I absolutely adore. And that strawberry chocolate creme smoothie just looks to die for. Loving all of this! That Chufli looks amazing! I’ve never heard of it before I’m going to have to try hunting it down to see if we have it in Australia. saw the chufli for the first time a couple of days ago. Maybe it’s new? Wise words spoken. Shoulds almost never make me lucks as well! Lemon Mint water is so refreshing! My mint is just starting to come up in the yard so I will be making some soon. I’m totally digging on the cheese quesadillas. Those look delicious. Yum. I am having this kind of water for days now and I can’t get enough! So refreahing. I would kill for those quesadillas right now!